The Telecommunications Industry Association (TIA), which represent the manufacturers and suppliers of high-tech communications networks, filed comments with the FCC advocating an expansion of unlicensed access to the 5 GHz Band on a technology-neutral basis. TIA noted that commercial wireless networks are already offloading 47 percent of all traffic to fixed wireline networks and that offloading is projected to grow to 66 percent by 2017. The next generation of Wi-Fi, IEEE 802.11ac, allows a significant increase in data rates by empowering wider channel bandwidths than prior Wi-Fi standards, and is designed to take maximum advantage of the large contiguous 5 GHz band that would be created in the United States by designation of the 5350-5470 MHz and 5850-5925 MHz bands for “Unlicensed National Information Infrastructure” (U-NII) use. T-Systems and Orange Business Services signed an interprovider agreement for corporate video services that will allow customers who use T-Systems' Corporate Video Exchange Services to meet live with customers of Orange's Telepresence Community via videoconference. T-Systems and Orange Business Services already have video interconnections with other providers in place and will continue to expand these networks to give their customers access to as many video users around the world as possible. 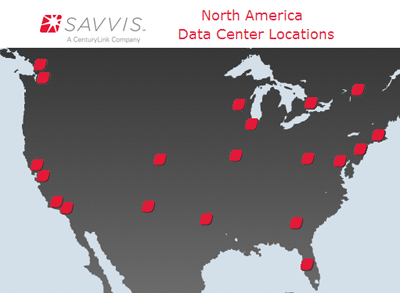 CenturyLink's Savvis division announced 10 expansions to its worldwide data center footprint, including the opening of new facilities in Hong Kong and London. "Whether it's empowering stock trades in the global market, pulling data from the cloud to deliver life-saving medical treatments or simply sending e-cards to friends across the world, the foundational technology that makes it all possible resides in a data center," said Jeff Von Deylen, president of Savvis. "By expanding our footprint, we're giving businesses additional strategic, secure locations and interconnectivity opportunities for growing their capabilities and core business offerings through infrastructure outsourcing." 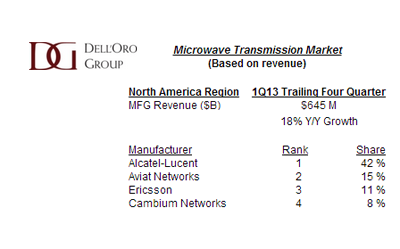 The point-to-point Microwave Transmission equipment market grew 33 percent year-over-year in the North American region, according to a newly published report by Dell'Oro Group. For the trailing four quarter period, the North American microwave market grew 18 percent over the year ago period reaching $645 million. However, North America was the only region to achieve significant positive growth in the first quarter 2013. Dell'Oro finds that Alcatel-Lucent benefited from its dominant North American market position, growing its trailing four quarter revenues 28 percent year-over-year. "LTE mobile radio backhaul has been a catalyst for high speed microwave equipment roll-out in the North American market," said Jimmy Yu, Vice President of Microwave Transmission research at Dell'Oro Group. "While fiber backhaul to cell towers has been the focus over the past few years, time-to-market is one the strongest advantages that microwave has had. So as operators work towards offering LTE coverage in geographic regions where fiber isn't readily available, microwave has been proven to be a great alternative to meet the bandwidth, reliability and quality requirements while reducing installation times from years to weeks," Yu added. The HomeGrid Forum and the HomePNA Alliance have merged into a single industry group dedicated to promoting G.hn for home networks while continuing support for HomePNA. The combined organization, under the HomeGrid Forum banner, will promote the smooth transition of all current generation wireline home networking technologies to G.hn, the “any wire” technology defined by ITU-T open international standards. The merged HomeGrid Forum has more than 70 members, including 28 Service providers, and some of the largest OEMs, ODMs and retailers in the world. Sonus has formed a partnership with Juniper Networks to develop SDN solutions. The partners will integrate the Sonus 5000 Series of Session Border Controllers (SBCs) with the Juniper MX Series Routers and SRC Policy Engine in order to pool intelligence from the application/session layers of the OSI stack with the network layer. Sonus and Juniper Networks are also working to deliver, test and demonstrate integration between Sonus Session Border Controllers and Juniper Networks JunosV App Engine. T-Mobile awarded a three-year contract to Ericsson for application development and maintenance for its billing system in Poland. T-Mobile, Poland has previously selected the Ericsson BSCS iX, a billing system that is now complemented with a service to cost-efficiently develop and maintain the associated business-critical applications. Ericsson noted that it employs over 12,000 consulting and systems integration professionals globally. In addition, Ericsson is the global leader in Business Support Systems (BSS) with more than 1,000 billing and revenue management solutions supporting more than 2 billion subscriptions. he report warns that the cyber intrusions are far more extensive than previously acknowledged by the Obama Administration and will greatly help China accelerate its own developments of advanced weapons. 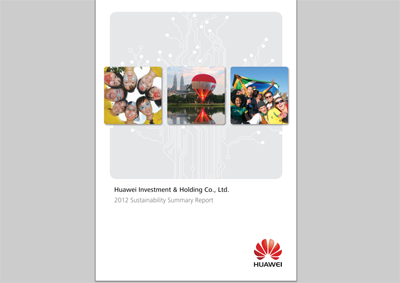 Huawei published its 2012 Sustainability Report, focusing on its efforts to bridge the digital divide, supporting stable and secure network operations, promoting environmental protection, and seeking win-win development. In 2012, Huawei demonstrated optical transport at 2 Tbps line rate. This will lead to DWDM systems with 56 Tbps capacity per fiber. As of September 2012, Huawei had deployed 100G networks for more than 40 customers in over 30 countries and regions. In 2012, Huawei supported communications security for one-third of the world’s population and supported the stable operations of 1,521networks for more than 600 customers in over 140 countries and regions. Huawei will begin offering carbon footprint data for all of its devices. In addition, the company has optimized methods for assessing the carbon footprint of such devices as mobile phones, mobile broadband products, and home devices. The company so far has released assessment reports for the carbon footprint of ten selected products. Huawei now has over 30,000 non-Chinese employees in 156 countries. 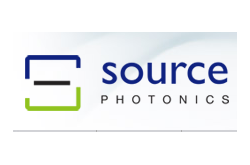 Source Photonics, which supplies optical transceivers and subsystems, named Doug Wright as president and chief executive officer, effective immediately. Wright succeeds current CEO, Dr. Near Margalit, who will assume the role of chief product officer. Prior to joining Source Photonics, Wright served as a group president at United Technologies for five years, primarily based in Shanghai. Source Photonics is based in Chatsworth, California, with offices in China and Taiwan.